One of the other sites I run is a video directory called Videos of the World. It's pretty much a directory of videos covering nearly every country in the world. But now I've extended the site to be both video and country-specific search. I've just added the ability to do a country-specific Google search for about 150 of those countries. 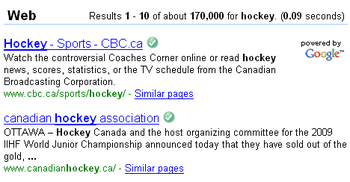 For example, on the Canada page, you can now do a Google Canada search on the Canadian domain www.google.ca. On the results page, if you want to drill down even further to Canada-specific, choose "pages from Canada". So now you can do country-specific search for 150 countries. Enjoy! The remaining 70 or so countries do not have their own Google domain. For example, there is no specific Google domain for Yemen. Here is Quintura, rated the #1 Alternative Search Engine of 2007 by Charles Knight of Alt Search Engines. The site had 70k visitors in December 2007 according to Compete. Quintura is based in Alexandria, Virginia.